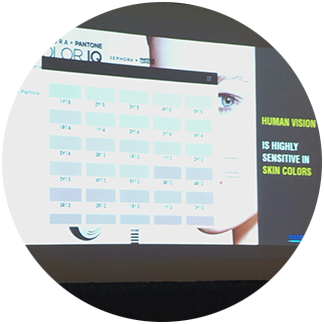 Kyungah Choi presented a work entitled, “Skin-representative region in a face for finding real skin color” at the IS&T International Symposium on Electronic Imaging (EI 2017) in Burlingame, California. The study suggests an algorithm for finding one’s skin region based on the primary calculation of the center region of the face for accurate detection and reduced computational load. The performance of the developed algorithm was confirmed with a data set that includes more than 300 facial images. Skin detection is used in applications in computer vision, including image correction, image–content filtering, image processing, and skin classification. In this study, we propose an accurate and effective method for detecting the most representative skin color in one’s face based on the face’s center region, which is free from nonskin-colored features, such as eyebrows, hair, and makeup. The face’s center region is defined as the region horizontally between the eyes and vertically from the middle to the tip of one’s nose. The performance of the developed algorithm was verified with a data set that includes more than 300 facial images taken under various illuminant conditions. Compared to previous works, the proposed algorithm resulted in a more accurate skin color detection with reduced computational load.